NOTE: the download may not reflect the current version, however it will update during the first launch. Recommended: This download contains program files and pre-defined custom apps profiles and templates to get you started with minimal configuration to replace default logos and other branding items. Branding instructions included. This download contains program files only and is completely empty of any configuration, best suited for those who want to start from scratch or those who already have a config to import from a previous edition of d7IIx or d7II. Please keep up with current information and announcements via our newsletter and blog/RSS feeds, and subscribe to our Youtube channel for videos and upcoming/on-air notifications of the d7xTech Show! See “LINKS to ALL d7x Resources and Information” below for these and other important links! Please see d7x Server Connectivity if you are experiencing connectivity issues when attempting to activate your d7x license. This may be necessary to prevent false positives in legitimate/clean copies of d7x and related binaries, and many other optional 3rd party applications that a PC technician may choose to use in a malware removal or Windows repair scenario. Typically all protection settings must be disabled entirely (no matter how irrelevant they seem, like web protection features) in order to run this and other legitimate software used in PC repair, even from within Windows safe mode! Extract to a new folder, anywhere on the hard drive. d7x is a portable application not requiring installation, and may run anywhere on the local system. Typically we extract to a folder on the user’s Desktop. When run from outside the local file system, d7x will copy the needed components locally as necessary, by default to the %systemdrive%\Support\d7x folder. 3a. (Recommended for new users!) Skip the last configuration step by choosing the “Starter Config” download above. This download is complete with many settings configured for ease of use, as well as custom apps and internal functionality already populated and arranged with best practices in mind. This provides a great basis for getting started, and you can make changes at any time. 3b. (The “Clean Install” method) Launch the numbered d7x vx.x.x.x.exe and allow it to self-update as necessary, and download/extract any other necessary components. The software should soon prompt you to enter your license information. Please be patient, the first run can take a minute, especially with d7x (which may not appear visible on screen at first.) If the software is running in Task Manager and using resources, allow it to finish. If absent, or the software does restart after a self-update, just double-click the exe to start it up again, at which point you should see the prompt you to enter your license information. 3c. Existing users (who wish to save existing configurations) should instead read “Updating d7II to d7x” in on the main page of the d7x Manual. PLEASE NOTE: You only need to register/activate d7x one time, after which you will copy the entire d7x folder (where you extracted it) for your technicians to use through network paths, on flash drives, etc. The manual also contains a section for the d7x Remote Deployment Tool, which you can create once d7x is initially activated. b. This step applies ONLY if you purchased your subscription prior to August 2018: You will need your registered company name and the product/license key for activation, which we send to you after we setup your account on our servers. PLEASE NOTE: The software is required to reflect your company name in the title bar of the application, which you provided during checkout/payment. Your company name is tied to your product/activation key, so that it cannot be changed without invalidating the product license. The company name cannot be modified after account creation without additional charges; contact us for more information. c. You are asked to create your own “Technician Password“, which is NOT related to the d7x Account credentials. You will create this password to use for encrypting any data you store on our servers (we do not need this from you.) This password is also for your technicians to use with various d7x functionality, so don’t make it too difficult! Please see The “Technician Password” for important details. Once started, click the Main drop-down menu of the d7x interface, then click Check for Updates. You may receive a message that no application updates were found if you are running the latest version. This does not mean that updates were not processed for additional executables (modules) used by d7x, as well as updates for default custom app configurations, which are all updated automatically by the Check for Updates function. Populate the custom action lists in the main interface as desired, to include the d7x internal functionality and custom apps you wish to use. For the “Auto Mode” on each tab, these functions and apps will run in order, from top to bottom, left to right. For initial setup, you should use the RESET button on the bottom right to auto-populate some default apps/functions into the fields. From there you can continue to arrange as necessary, and don’t forget to browse through the config, particularly the first tab on Behavior and the second tab for Sessions. Register d7x one time only, and make copies of the d7x folder for any other technicians using the product after registration and initial configuration. Always keep fully configured copies of d7x on tech bench computers, network shares, and flash drives; avoid using the remote deployment tools unless actually working remotely. When you need to register a new copy of d7x then please use the Browse button at the registration prompt to find/import your existing d7II compatible license file (.\Config\Reg.Settings.dat from d7II, or .\d7x Resources\Config\d7II.License.dat from d7x), which ensures the exact same “Technician Password” is used. This does NOT import your entire configuration, but instead only imports account credentials, registration data, and the “Technician Password” itself. We highly recommend viewing the 7 videos on our d7x Intro playlist for setup and initial configuration. Use to keep/update an existing configuration. Download the “blank config” zip file, place d7x v0.0.0.0.exe inside an existing directory with a registered/working copy of d7II.exe or a previous d7x vX.X.X.X.exe file. Be sure to DELETE any existing copies of d7II.exe or any d7x vX.X.X.X.exe files in that directory. When you start the d7x exe, it will use the existing resources from that directory, including the registration information. Use to start with a new/blank config or starter config. Download the blank config zip file, extract d7x v0.0.0.0.exe to an empty folder, launch and register it. It is strongly recommended to register d7x (or any fresh download of a d7x or d7II product) by using the Browse button to find/import your existing d7II\Config\Reg.Settings.dat file, which ensures the exact same “Technician Password” is used; see the note on the Technician Password below for more information. d7x New User Guide – A collection of videos for new user setup and orientation with d7x. d7x Info – All newer d7x specific videos (except the New User Guide) for new and existing d7x subscribers. d7x Quick Tips – These short videos provide quick usage tips on various d7x features and functionality. d7x Release Notes – Covering new features and functionality changes from d7x release notes. *** Always use the “End Session” button when finished with d7x on any system, even if you launched the software once, did nothing, and closed it. The “End Session” button can seen as an option when clicking the red X to close the main d7x interface. If that’s enough explanation, then you can skip the rest of this section, which explains what a ‘session’ is and what it does. * Creates registry entries necessary for operation for auto mode functionality with itself (remembering options after reboot or program restarts) as well as for exchanging settings and path information for external applications used with d7x, for scripting functionality, and for 3rd party applications that you may be using. * Applies whitelisting to Windows Defender (where possible) on d7x and subdirectories. * Applies group policy settings (if configured) such as Windows Update and even using a WSUS server on your local network. * Applies other preferences in Windows settings that you use to work on a system, such as showing hidden files, system files, file extensions, and more! * Installs right-click context menu items in Windows Explorer (the ‘shell extensions’) to be used for quick work with d7x on files in the file system. * Automatically run any scripts, d7x internal functions including creating system reports, or 3rd party applications that you have configured. In order to remove these session specific settings (especially the Explorer context menus) you MUST use the “End Session” button on the “End Session” tab after you are finished with d7x on that system. Alternately, the red X button at the top right of the app will give you the End Session option as well, executing the End Session options as configured on the “End Session” tab. * Email reports/logs to the tech. * Upload reports/logs to your self-hosted FTP, including a method to send reports to your customer ticket in the 3rd party PC Repair Tracker software. * Upload any configuration changes made during the session, either to our cloud storage or your self-hosted FTP. * Apply other settings changes to Windows. * Automatically run any scripts, d7x internal functions, or even install other 3rd party applications that you have configured. You could think of it as an “install” and “uninstall” however the terms are not correct in that d7x are portable applications, which can be run from anywhere with no installation package or process. As such, you won’t find them in the installed programs lists of Windows Settings/Control Panel, and therefore there is no uninstall package to worry about. Simply close the program a different way (End Session) when you are finished! Those familiar with the original d7 may know that it performed many of these temporary system modifications at each program start, and also removed them at each shutdown. This behavior was changed with d7II and now d7x to increase startup speed and mitigate other potential issues, as well as to add easy indicators for applying other permanent modifications that can be made as you have configured them (such as applying your custom branding to the operating system) but these aren’t applicable here. Final Note: When d7x is launched on a system, you cannot start a new copy of d7x from a different folder until you End Session from d7x. d7x will always find and launch the d7x .exe that was originally launched on that system, terminating itself on success. This is by design, in order to properly preserve session data and reports, so that you may safely finish your work with d7x.exe as necessary without confusing files and settings from a different copy of d7x in a different folder. This typically only impacts people configuring d7x on a tech bench system, where no repairs are being performed however multiple copies of d7x exist and are used for configuration from different folders. The first time d7x or d7II.exe is launched without an existing registration file, the user is prompted to create the “Technician Password“, which is NOT related to the d7x Account (aka dCloud) credentials. This password is used as an encryption key for your customized d7x/d7II configurations, when stored in the dCloud portal or on your own self-hosted FTP server. It is also used for various d7x functionality (e.g. “Main” menu > “Lock Screen”) so rather than receiving a randomly generated password from us, it should be familiar and easy enough for any techs using the product to remember. Unexpected registration prompt on d7x (or d7II) startup, indicating a blank configuration; occurs after updating a config from dCloud/FTP. If a different “Technician Password” is used to register multiple copies of d7x (including d7II) and these copies are in use, especially when using the same config name (such as the Default) this will cause config data previously encrypted by earlier copies of the software (such as your dCloud/FTP stored configurations and branding customizations) to be unreadable in other copies of d7x or d7II, including the SFX Mini and d7xRDT tools used for remote deployment. If multiple configs encrypted with different Technician Passwords are saved/uploaded to dCloud/FTP overwriting a previous config of the same name (note your settings may be configured to auto-save during End Session) then any other copies of d7x/d7II/SFX Mini/d7xRDT configured with the other Technician Password will also update to a blank configuration. Without an existing config and the Reg.Settings.dat file, you will simply need to reconfigure d7x from scratch. Be aware the issue WILL reoccur when you use older copies configured with the older Technician Password, so especially with the remote deployment tools, you should destroy all older copies of these and d7II/d7x that would be using the old password. 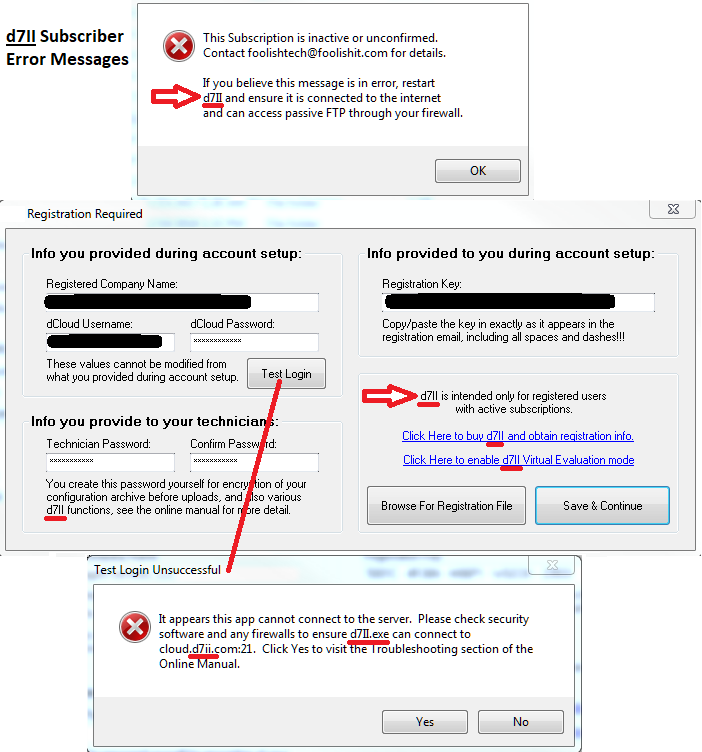 For new subscribers, if the account credentials and registration/product key are given to multiple techs instead of copies of the registered software, then they will create the issue by using different Technician Passwords when registering separately. For existing users, registering a new copy of d7x (or d7II) or “fresh download” can lead to this problem. If the tech has never (or rarely) used certain features in d7II requiring the Technician Password to proceed (e.g. “Main” menu > “Lock Screen”) they may not remember the password created during initial registration, or even what it was for, and use a different password when registering a new copy. Additionally, relying entirely on the remote deployment tools (d7xRDT or d7II SFX Mini) can lead to loss of your configuration, should this problem occur. Not only do they slow down initial startup and always require internet access, but they will also fail to extract your config if it is ever saved/uploaded by any copy using a different Technician Password. Register d7x one time only, and make copies of the d7x folder for any other technicians using the product after registering. When you need to register a new copy of d7x (or any fresh download of any d7II product) then please use the Browse button at the registration prompt to find/import your existing d7II compatible license file (.\Config\Reg.Settings.dat from d7II, or .\d7x Resources\Config\d7II.License.dat from d7x), which ensures the exact same “Technician Password” is used. This does NOT import your entire configuration, but instead only imports account credentials, registration data, and the “Technician Password” itself. If you do not wish to import the registration file, keep in mind that while you may copy/paste your registration information manually, you must be certain to type in the exact same “Technician Password” (case sensitive) to avoid these issues in the future. While we can decode this password from an unencrypted d7II based settings file (if you had one available to send us) we cannot retrieve the password from an encrypted configuration archive (either on our servers or in your possession) since that very password was used to perform the encryption! Please see d7x Server Connectivity for issues in activating d7x, using the Config Mgmt Portal, or the d7xRDT. 2. Ensure the d7x process has terminated before starting d7x again. d7x will attempt to pick up wherever it left off after a crash, so if it was in “Auto Mode” it will pick up with the next item in the list after restarting. You can also reboot the PC (if necessary) and d7x will still attempt to pick up wherever it left off. 3. You cannot run multiple copies of d7x at the same time. Launching any new instance of d7x will terminate itself if an existing one is found. The only exception is when d7x relaunches multiple copies of itself for other various purposes, however you cannot launch multiple copies for normal use. d7x can fail to start or in other tasks when run from your own PC, or a “TBC” aka “Tech Bench Computer” even though it does NOT fail at those tasks on a customer’s PC. This can be an issue if your own PC is frequently used for d7x downloading/updating and configuring, especially when multiple copies of d7x are located and used from multiple locations on that PC, and the operator ignores the Session concept when switching between them (this can ultimately cause a lot of configuration headache, especially with the d7x Remote Deployment Tool.) d7x always uses the Config and other resource folders that it was using when a session was first started on that PC, even from a different copy of d7x in a different folder. Note this will not always be the only source for session data as d7x<->d7II compatibility is phased out with the introduction of newer features. 2. If d7x still won’t behave, then open the .\d7x Resources\Config dir where you are running d7x from, and ensure your computer name is not listed in the TechPCs.txt file (if it exists) and if so then remove it/save/retry with d7x. Note that you should always follow step 1 first (deleting the registry key for session data) since it could be pointing to a different \Config dir than you think you are working with. This is because d7x will use the \Config directory it was using when a session is started on that PC, even if it was started by a different copy of d7x from a different folder. [Revision In Process] Some information below was originally written for d7II, but also applies to d7x. Some interface screen shots and other information may not apply to d7x. d7x Config Files – Outlines what each configuration file is responsible for. dSupportSuite Info/Usage (video) – What it is, what is included with your d7x subscription, and how to get started. dSupportSuite Client Software Overview (video) – An overview of the client software which is included with d7x. See the video notes for links to specific sections of the dSupportSuite configuration. [TO BE PHASED OUT] Currently intended as a functionality reference for d7II and d7x. Written for the original d7 product line, most functionality descriptions and behavior will also apply to d7II and d7x. Please be aware that interface screen shots and some behavioral information will not apply to d7II or d7x. Additionally, a lot of technical information in the functionality descriptions will be lacking new content, as much has been added and improved since the original d7! Below you will find the recent highlights, but all release build notes are available here. As for other connectivity issues, d7x requires access to several servers which could be restricted by a software or hardware firewall/NAT router or a UTM appliance. d7x software will not activate your purchased license. An already activated copy of d7x can exhibit other behaviors as described below. d7x may fail to report or downloaded updated versions of it’s own software binaries, as well as default custom apps profile updates. d7x may fail with various functionality related to the Config Mgmt Portal, which stores your d7x configurations and custom definition files. Both of the above methods are used for various communications, so both must be available. With both HTTP and FTP protocols, d7x now defaults to an SSL connection, however should d7x fail to connect over SSL, it will also try non-SSL connections as well. d7x connectivity uses not only HTTP/HTTPS, but also Passive FTP/FTPS to access different servers for different purposes. In Passive FTP, the client uses a standard port as a “control channel” to initiate communication with the server, which then responds with a randomly selected port in the upper range (we configure for 49000-54000) allowing the client to initiate a new outgoing TCP connection with the server from this port for data transfers. This works well in most cases, because firewalls typically do not block outgoing TCP connections. Troubleshooting an FTP issue can be as simple as consulting your model’s documentation, or better yet, search the internet for issues using the model number with ‘FTP’ and look for keywords like ‘problem’ or ‘issue’ and similar. In some cases a “smart” NAT router can block FTP over SSL (Implicit or Explicit) or any tightly locked down system can block all Passive FTP traffic if configured to block outgoing TCP connections on non-HTTP based ports; this should be extremely rare. Similar issues can occur with some SPI firewalls due to default internal logic, but this should also be very rare. In cases such as these where SSL connectivity over FTP is not possible, d7x will fall back to non-SSL connections. Unfortunately a NAT/firewall can still block insecure Passive mode FTP traffic under certain configurations. There are at least two models of Sonicwall routers that include a setting to “Block FTP Bounce Attacks” which is enabled by default, and will block all Passive FTP traffic. We cannot confirm but there may have been a model of Cisco router that shipped with a similar setting enabled by default. Fortunately, these older models are less common to find, and other similar configurations are also less likely since Passive mode FTP usage became widespread years ago due to the common usage of firewalls which block the incoming TCP connections required by Active mode FTP. d7x requires Windows XP SP2, but SP3 is recommended for all functionality. All dependencies are already included in the portable d7x folder after it’s first run (downloaded on demand during the first launch, or if ever found missing) and all files can be copied to any other system along with d7x, as with any other portable application. * NOTE: The .NET Framework is NOT required in any form, as it has historically proven very prone to disaster (one of d7/d7II’s many uses in the past was busted .NET repair for apps that wouldn’t launch.) After 15+ years of .NET it finally seems stable enough to not self-destruct, however in the future we also expect to see newer malware target .NET and other newer OS technologies as more and more applications (e.g. Anti-Virus/Malware companies) trust and rely on it for easier development of the “modern” graphical user interfaces. We encourage you to submit new issues/bug reports for unique issues, asking that you first confirm it is not recognized in the “Current Limitations” or “Known Issues” located under the Release Notes section of the d7x Manual, or that you have new information on an existing issue represented in those sections. We also ask that you separate submissions for issues that aren’t related to one another. Determining single vs. multiple issues is not always clear, so please use your best judgement while keeping in mind the specifics of the environment, time frame, and order in which these issues occurred. You may also visit the d7x section of our Message Forums to post your questions or feature suggestions. 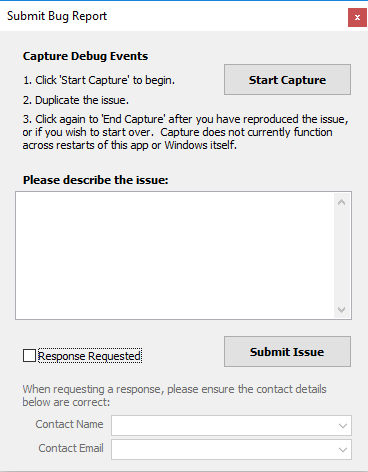 When possible, please submit reproducible issues directly from d7x via the ‘Main‘ menu > ‘Create/Submit Bug Report‘ option, which will include structured and detailed debug information about the error. Here is a quick video on the process. 1. Use a valid email address when requesting a response. * We no longer provide a built-in SMTP server, as done in early versions of d7II and d7 with dCloud; the functionality was removed due to recurring issues with security/spam filtering in use at the email host/ISP level. Although we realize we are asking a great deal of detail on your part, the information accuracy even to the smallest detail is often vital to solving issues efficiently by reducing communication time with support staff. Is the behavior specific to Windows operating in "Normal Mode" or does the exact same issue also occur in Windows "Safe Mode"? Yes, it's consistent but only on one PC. Yes, it's consistent but only on a particular OS version/type. Yes, it's consistent when tested across different PCs and OS versions/types. No, it seems random. Check here if you wish to be contacted regarding this issue, or if in the future you may wish to add more specific information about this bug after further investigation; we will be in contact soon. Please do not re-submit this form more than once for the same issue, nor to add additional information about same issue (as it would create multiple tickets in our support queue, and making aggregation of the available information more difficult. No, I don't need a response (I think you have all the info!) Yes, please contact me (I plan to provide more information after further troubleshooting.) Yes, please contact me, I need help!